Humanity has added new value to the places it has lived upon, and left behind masterpieces that carry Its culture to ensuing generations. To affirm the values accepted as the common heritage of all humanity, and to promote them and to transfer them to future generations, UNESCO adopted, "The Convention concerning the Protection of the World Cultural and Natural Heritage" in its General Conference held in Paris in 1972. Turkey ratified the Convention on 23 May 1982. The World Heritage List Is a list of global sites of cultural and natural heritage considered to be of outstanding value to humanity. UNESCO, which alms to ensure International cooperation In protecting the values that form the common heritage of humanity, takes Into consideration unique values with respect to cultural and natural criteria. At the end of 2008, there were 878 cultural and natural heritage sites from all around the world inscribed in the World Heritage List. These Include 679 cultural/archaeological sites, 174 natural sites and also 25 mixed (cultural/natural) sites. 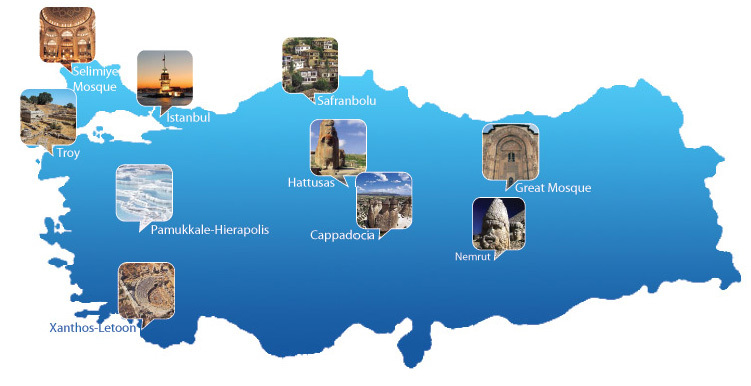 Turkey has 10 properties Inscribed In the UNESCO World Heritage List, and 26 nominated properties are in the Tentative List. This publication is prepared by the Directorate General for Promotion of the Ministry of Culture and Tourism. It aims to promote the sites Inscribed In the UNESCO World Heritage List, and raise awareness in transferring Turkey's cultural heritage to future generations.